Boasting an excellent location right on the volcanic cliffs of Caldera, Thermes Luxury Villas provides the perfect setting for your summer holiday in Santorini. All well-appointed villas feature beautiful furnishings and natural colors creating an utterly serene and relaxing atmosphere where guests can unwind their body and mind, as well as spend some quality time with their friends, family or significant other. Thanks to their ample interiors, 2-bedroom and 3-bedroom villas offer a capacity of up to 8 guests and are suitable to accommodate families or groups of friends alike. Hang out in the comfortable seating area of the villas watching TV or stay out in the fantastic view terrace and enjoy your friends' company in absolute privacy. What's more for fun-filled moments with your children there is a private swimming pool overlooking the vastness of the Aegean Sea. Follow Thermes Luxury Villas's board Family Holidays at Thermes Luxury Villas on Pinterest. Soak up that all important sun and sea breeze, and let your little ones be thrilled by the unique scenery Santorini has to offer. Designed for your total safety and convenience, all properties at Thermes are ideal for big and smaller children too. Further to what it has to do with your family holiday, our concierge team is always available and ready to help you with baby-sitting services in case mum and dad want to plan a romantic evening out! 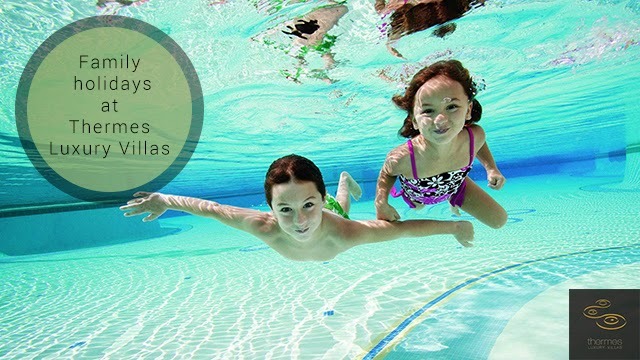 So what are you waiting for...book your family holiday with Thermes this summer and let luxury surround all of you!